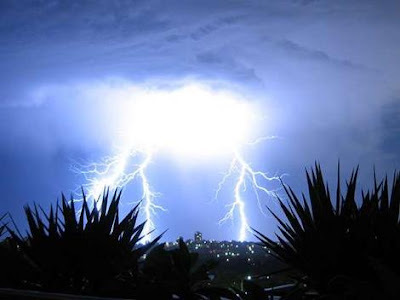 Last night Sydney had a big lightning storm. It was big for Sydney anyway. I have been living on the east cost of Australia for 8 and a half years and I have to say that these "down-southers" really need to stop referring to the piddly rain we get here as "monsoonal". You can look up the definition of monsoonal rain and you can nod and say "yep that's what we had" but until the day you know what it is for rain to hurt or that moment when you see the wall of rain approaching and decide to run, until then you do not truly understand. I grew up in Darwin, where it starts to rain around the end of October and stops in February. It's news when it is going to be dry, not when it's going to rain.